The German Aerospace Center (DLR) and Endesa test direct solar steam generation and energy storage in this pilot plant in Carboneras, located in southern Spain. In this type of solar power plant, steam is produced directly from concentrated solar radiation and used to drive a generator. The highlight of this facility is a new system that efficiently stores energy, both as sensible and latent heat. The stored energy can be used to generate electricity even at night. Ulrich Wagner, DLR Executive Board Member for Energy and Transport (left), and Eduardo Santos of the Spanish utility company Endesa, inaugurated a direct solar steam generation and energy storage pilot plant at Carboneras, located in southern Spain. In this type of solar power plant, steam is produced directly from concentrated solar radiation and used to drive a generator. The highlight of this facility is a new system that efficiently stores energy, both as sensible heat (where energy is accumulated as the temperature of the storage medium increases) and latent heat (where energy is accumulated as the storage medium changes phase from solid to liquid). The stored energy can be used to generate electricity even at night. The salt-based latent heat storage system works using a phase transition. At 305 degrees Celsius, the salt absorbs energy by transitioning from a solid to a liquid state. Latent heat is 'hidden' energy. Energy is accumulated as the storage medium changes phase from solid to liquid. On 31 March 2011 the German Aerospace Center (Deutsches Zentrum für Luft- und Raumfahrt; DLR) and Spanish utility company Endesa inaugurated a direct solar steam generation and energy storage pilot plant at Carboneras, located in southern Spain. In this type of solar power plant, steam is produced directly from concentrated solar radiation and used to drive a generator. The highlight of this facility is a new system that efficiently stores energy, both as sensible heat (where energy is accumulated as the temperature of the storage medium increases) and latent heat (where energy is accumulated as the storage medium changes phase from solid to liquid). The stored energy can be used to generate electricity even at night. 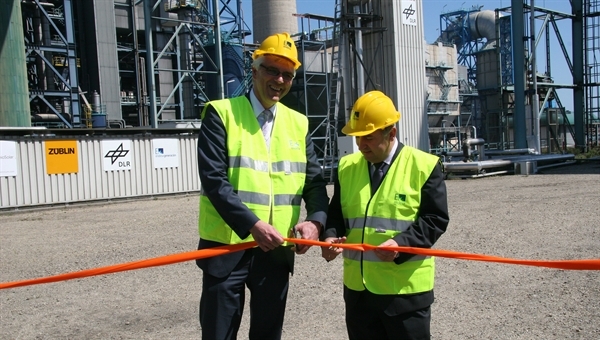 "This pilot facility is an important milestone in making solar-thermal power plants more efficient and cost-effective. Companies in the industry are very interested in both the new process of direct evaporation and efficient latent heat storage," said Ulrich Wagner, DLR Executive Board Member for Energy and Transport, at the opening. DLR and Endesa constructed the pilot facility with partners Flagsol GmbH, MAN-Ferrostaal, Senior Berghöfer GmbH, SCHOTT Solar CSP GmbH, Milenio Solar S.A. and Ed. Züblin AG. In parabolic trough solar power plants, sunlight is concentrated onto a receiver tube located at the focus of the parabolic mirrors and converted into heat. In existing power plants, synthetic oil flows through these receivers and is heated to about 390 degrees Celsius. The heated oil heats water, producing steam that drives a turbine to generate electricity. In the pilot facility at Carboneras, the steam is generated directly within the receivers. The receiver tubes are under a pressure of up to 120 bar, producing superheated steam at a temperature of 500 degrees Celsius. The use of water as the direct working medium in the solar collectors allows a higher process temperature and increases the efficiency of the power plant. Therefore, direct solar steam generation is an opportunity to reduce the cost of solar thermal power generation. "Our pilot facility is designed for testing and improving both the system as a whole and its individual components," said project leader Markus Eck from the DLR Facility for Solar Research, outlining the challenges presented by the system. For example, the flexible pipe connections in the system, which are needed to enable the parabolic troughs to rotate so they can track the Sun, are being tested. "The joints must withstand a pressure of 120 bar and remain absolutely steam tight." The receivers set up at Carboneras were developed and manufactured by SCHOTT Solar CSP GmbH and the flexible pipe connections by Senior-Berghöfer GmbH. A big advantage of solar thermal power plants is that they can store energy in the form of heat. This means that the facilities can produce power to meet demand during cloudy weather or at night. 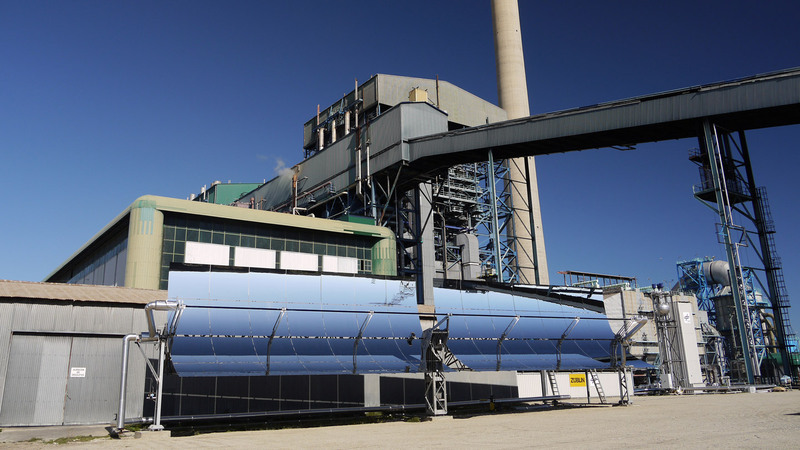 Direct solar steam generation requires storage technologies that are adapted to suit this new technique. An important requirement for these technologies is that they efficiently store the large amount of energy released during the condensation of steam, a process that occurs at constant temperature. In the pilot facility now in operation, this challenge is met using a combined storage system with storage units for both sensible and latent heat. The salt-based latent heat storage system works using a phase transition. At 305 degrees Celsius, the salt absorbs energy by transitioning from a solid to a liquid state. “The advantage of such a system is its capacity to store large amounts of energy in a small volume and with a minimal temperature change. The energy in the system can be transferred and absorbed very efficiently by phase transition at a constant temperature," explained Doerte Laing, Thermal Energy Storage Research Area Manager at the DLR Institute of Technical Thermodynamics. "This pilot facility gives us the opportunity to test the new combined storage system in any required mode of operation under well-defined conditions and to gain operational experience. The demand from industry for an efficient storage system for direct solar steam generation plants is very high." 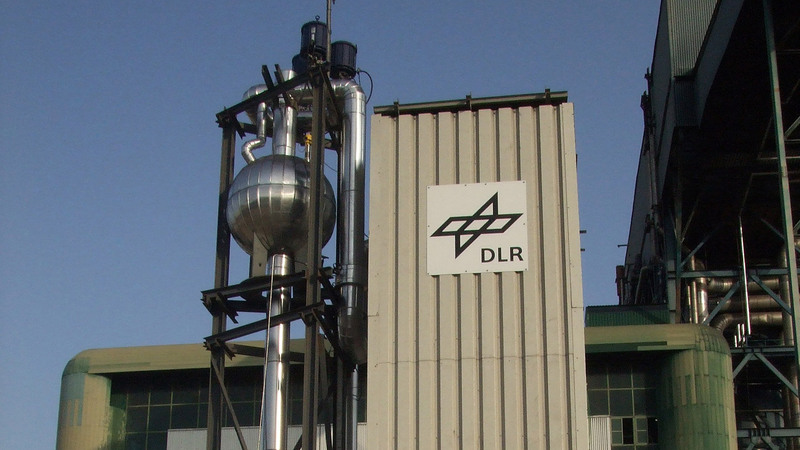 The storage system developed by DLR researchers is currently the largest high-temperature latent heat storage facility in the world. The sensible heat from the superheated steam is absorbed by a concrete storage system, which was developed jointly by DLR and Ed. Züblin AG. Researchers plan to use the pilot facility until the end of 2011 to provide functional validation of the key components of the storage system, receivers and flexible pipe connections. The project is supported by the German Federal Environment Ministry (Bundesumweltministerium; BMU) and the Spanish Corporación Tecnológica de Andalucía (CTA).